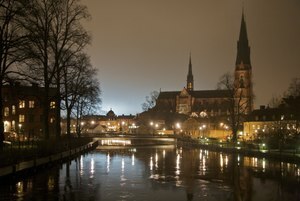 Uppsala Cathedral in background of the Fyris river at night. Uppsala is a city in Sweden. About 200,000 people live there. It is the 4th biggest city in Sweden. The city is home to the well-known student residential area of Flogsta. It is the largest student residence in the city. It is also known for the Flogsta scream. At 10 pm every evening, students scream their frustrations from windows and balconies. ↑ 1.0 1.1 "Localities 2010, area, population and density in localities 2005 and 2010 and change in area and population". Statistics Sweden. 29 May 2012. Archived from the original on 17 December 2012. http://www.scb.se/Statistik/MI/MI0810/2010A01Z/01_Localities2010_land_area_pop_density_2005_2010.xls. This page was last changed on 6 October 2014, at 23:33.